So my point is, the stuff that makes it sweet without the sugar and low-cal can upset your tummy. Eat these guys in moderation to avoid gastro-issues. Since I had a whole bag of these goodies, I spread the wealth around to a few family members for more input. My 8-year-old said,â€œItâ€™s not too sour. I like it.â€ My husband says â€œWow. Immediately lemony. Sour, but not face-pinching sour.â€ Good reviews all around! And it might be a â€œjust meâ€ thing, but you know how some hard candies cut your mouth? I hate that. But that wasnâ€™t a problem at all with these drops. They melted evenly and didnâ€™t leave any rough edges. 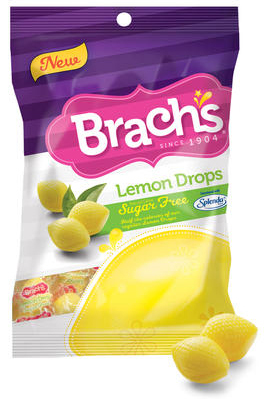 According to the Brachâ€™s website, their Sugar Free Lemon Drops are â€œTangy lemon goodness made with SplendaÂ®. And not a drop of guilt. Only half the calories of our regular Lemon Drops.â€ This reviewer believes they have met their claim. These candies are definitely a great option if you want or need a sugar free or reduced calorie candy. Just beware the isomalt. ha i love these candies, glad they made a decent sugar free version! you should check my Vodka Mixed Drinks website and learn how to make a Lemon Drop Martini!